We left the aire at Clérac around 12.00 and headed towards the nearest Lidl (all the European Lidl’s are stored in our satnav) for some supplies. We are going back to bottled water for tea – the local water leaves a suspicious looking scum on the cups. God knows what its doing to our insides! We stock up with 10 litres of water which should do us for a day or 2 – Alan drinks copious amounts of tea, constantly topping up his mug from the pot! This is probably the reason why our toilet cassette fills up so quickly! We made our way through the Dordogne region, where the vineyards stretched as far as we could see. All the vines have been pruned back to their ancient gnarly stumps for the winter. Everywhere is so beautiful and there’s a such a peaceful feeling to everything. 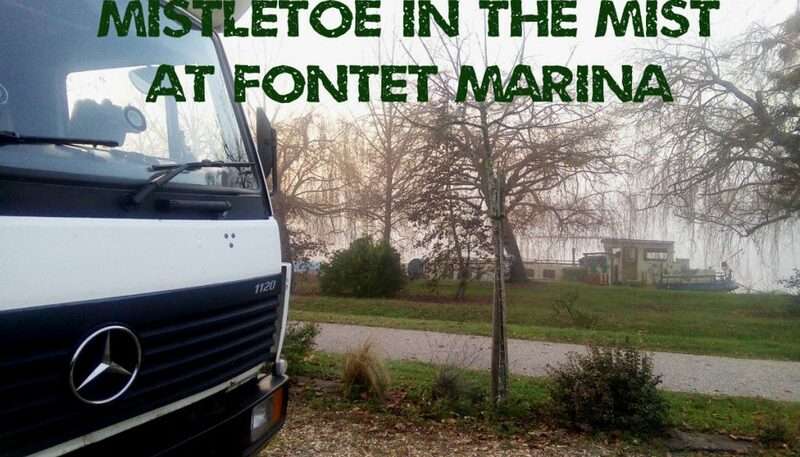 We had a fairly straightforward drive down to Fontet and arrived at a large marina – very quiet mostly closed for winter but €10 per night including electric. Access is through a gate opened by a code. If no-one is available to let you in there is a telephone number to call. When we arrived, the gates were open so we drove into the marina complex. We were approached by a lady working in the grounds and told to select a pitch, and that she would call at 8am the next morning to collect the payment…. in cash only. We have been used to paying by card at most of the aires and haven’t been carrying much cash – but we managed to wrestle together €10 in change and set it beside the door. Just as well as there was nowhere in the village to withdraw cash. Access was tight for Kelpie, being so large – but we were able to park into the end of the aire length ways where there would normally be space for 2 motorhomes. The marina at Fontet is channeled out at the side of the Canal de Garonne which joins the Canal du Midi at Toulouse, connecting the Atlantic to the Mediterranean. There is now a cycle path and walk along its entire length known as the “green way”. The marina itself is part of a leisure complex with parkland, fishing, a café and a swimming lake complete with a man-made sandy beach for the summer visitors. The marina was almost full with most of the boats moored up long term and connected to electricity for over the winter period. Once parked up and plugged into the electricity, we set out for a walk around the marina and along the canal towards the river Garonne. A very narrow road bridge over the canal with right angle turns at each end – definitely not one for Kelpie! The walk along the canal was pleasant, but it was shrouded in a cold mist and with daylight fading fast, we didn’t venture too far from the aire. As we have driven through the countryside, Alan had commented on the number of crow’s nests in the trees. Today we were able to get a closer look and saw that the trees are actually full of clumps of wild mistletoe which grow parasitically on their hosts, just in time for Christmas. If we had a set of very long ladders, we could make quite a nice seasonal income! True to her word the lady rapped the door of the motorhome at 8am the next morning… way before our usual waking time. Bleary eyed and with ruffled hair, I opened the door to pay up and she gave me an official receipt, probably wondering from which planet this vision of loveliness had landed! We had a light breakfast, packed up and were soon on our way again through the mist chasing the elusive winter sun. Only a minor disaster today – Alan caught the side of the van on the corner of a road sign on another very sharp turn in the village, so we’ve got another scrape! The van will definitely need a respray by the time we get to Morocco.